Trump’s Herky-Jerky First Week It takes a while for any administration to settle down. But this one is off to an unusually awkward start. Last week’s column was on the inauguration. This week’s, up tomorrow night, will be a look at President Trump’s first days in office. Here I mention smaller things I saw or thought in Washington last week, as the Trump administration geared up to begin. Every new administration begins awkwardly. New White Houses are always herky-jerky, always on some level a months-long calamity, and each administration tries to hide its particular level of chaos from the press. (The Obama administration pretty much succeeded here; the Clinton administration did not.) But the Trump Hundred Days looks to be more awkward than usual. There are many reasons. A lot of Trump aides and staffers in the White House are new to government. Because they’re not veterans they have to learn the basics—what WHO is, what OPL is, how the staffing system works. Not all jobs are filled. Not all lines of authority are clear. Not everyone understands that old ways and systems exist for a reason. Getting your information together for the FBI field investigation, getting your temporary pass—everyone’s drinking from a fire hose. It takes a while for any administration to settle down. Then there are the facts specific and unique to this administration. 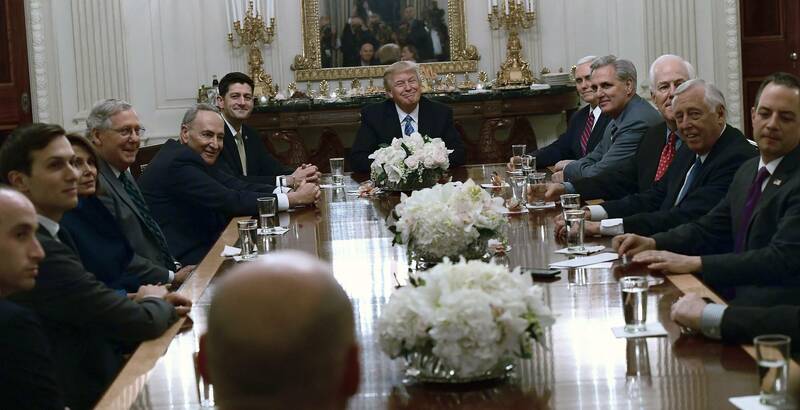 The talk in Washington all last week among experienced and mostly skeptical observers, some of whom had helped in the transition, was that there are too many individual power centers around Donald Trump with too many significant players who have their own small armies of loyalists. It was said that Reince Priebus, the new chief of staff, will never be able to herd these cats. It was said the cats will use him as a scratching post. Among Republicans who remember these things, there was talk of the spokes-of-the-wheel White House management style, with the president as the hub, and the old Jim Baker model, which was occasionally awkward and guaranteed a certain amount of jockeying and mischief—but worked. That was the Reagan White House troika, in which Mike Deaver was in charge of public presentation, Ed Meese in charge of domestic policy development and Mr. Baker, the chief of staff, in charge of coordinating everything and essentially running the joint. He took final problems to the president; he executed decisions; he spoke for the administration in friendly, off the record meetings with the press. Those who observed the transition say Mr. Trump will, inevitably and due to nature and habit, be a spokes-of-the-wheel chief executive, when he’d be better off with a strong chief of staff and clear lines. We’ll see. So will he. White House management styles evolve, usually as early trouble develops. And there is the unusual nature of Mr. Trump himself. There is a dynamic that is continuing with Mr. Trump as president that has been true of him since he announced for the presidency 19 months ago. It is that he makes it hard for potential allies to come to his side. There are men and women on the Hill who’d back him more colorfully and forcefully but they know the minute they do he’ll do something that embarrasses them—launch a tirade, send a tweet, say something awful—and that they’ll have to defend. They don’t understand why he harms himself, and they don’t wish the harm to wash over them. They keep a discreet distance in case they’ll some day have to run for their lives. He could make it so much easier for them, but he can’t. His relationship with Republicans on the Hill remains tentative and provisional. There are many reasons for this, not only his personality. What will nudge them more firmly into his corner will be his ability to develop broad popularity within the country. If Mr. Trump can, over the next few weeks and months, get his approval ratings going up, and then up substantially, that will make a big difference. His personality isn’t going to be what wins over Americans. He doesn’t have to go on “Between Two Ferns” or “Ellen.” Right now for him it will all come down to policy decisions. If those decisions garner support it will show up in the polls. (More on that tomorrow.) A good number of senators and congressmen on the GOP side, maybe most, can’t tell what’s popular anymore, but they can read a poll. If they start to hear, when they’re home, “Be good to my guy Donald,” that will make a difference, too. A note on how tentative is President Trump’s support among Washington Republicans, especially senators, congressmen and members of the political and journalistic class. I witnessed again and again last week what I now think of as the Trump do-si-do. Two men who are acquainted bump into each other at a social gathering. “So!” says the first man. “Yup!” says the second. They stand looking for clues in the eyes, the face. A shrug means one thing, a grin means something else. “I am!” If they’re both happy they mind-meld on hopes, if they’re unhappy they mind-meld on fears. If one is happy and the other not, they pat each other’s arms and part with a pleasantry as they slide by. I saw this over and over.